Lucille Johnstone enhances the lives of British Columbians in public and in private ways: whether volunteering, in a corporate boardroom or providing a meal to a less-fortunate stranger. Born and raised in Vancouver, she is currently the Chief Executive Office and Chair of Integrated Ferry Corporation, where the B.C. Super Ferry – the largest ship ever to be built in B.C. – was constructed. Before that Lucille Johnstone was President of the RivTow Group, in a career that spanned 45 years. Her involvement in charitable organizations would be admirable even for someone with extensive time to share. This includes present or past roles as chair of the Kwantlen College Fund Drive, Founding Director and Chair of Sexual Abuse Recovery Anonymous, and member of the Pacific Advisory Regional Council of Fisheries and Oceans. In addition, Lucille Johnstone is or has been on the board of directors of numerous organizations that include Grace Hospital, Vancouver International Airport Authority, Expo ’86, B.C. Place Ltd., and the Vancouver Board of Trade, to name only a few. 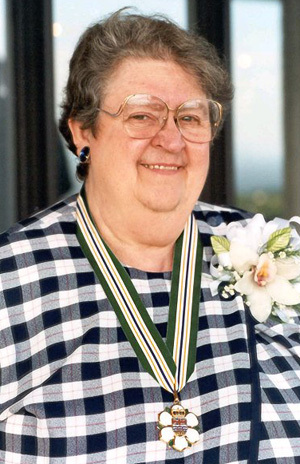 Lucille Johnstone is the recipient of the YWCA Woman of the Year Award and holds an honorary doctorate from U.B.C. In addition to the big picture of community service and business acumen, Lucille Johnstone is fondly known by many for the pearls of individual kindness she so generously casts about her.